I was honoured to take part in an important conversation last Thursday on the future of resort wear at Mercedes Benz Fashion Week Australia. 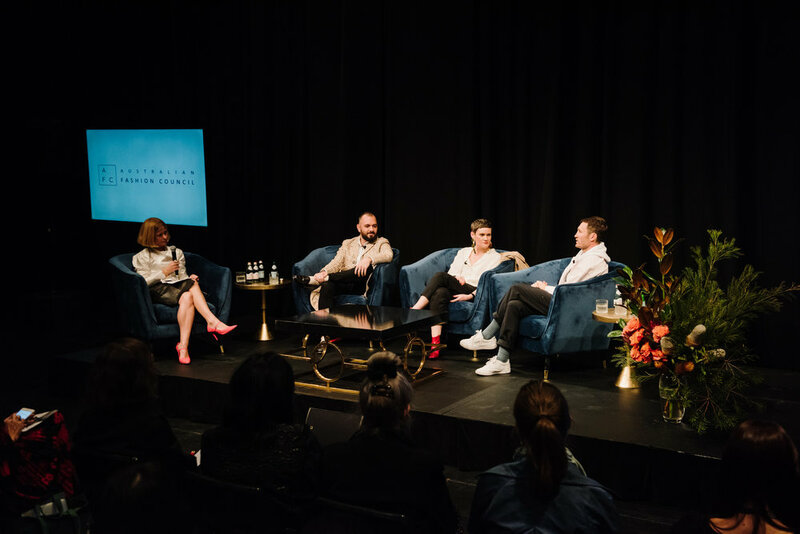 The discussion, hosted by Harpers Bazaar Australia Editor-in-Chief and Australian Fashion Council Board Director Kellie Hush focused on the impact of the resort wear market and the global appeal of Australian fashion. Fellow AFC members, Robert Moore CEO of Alice McCall and Toby Jones, Co-Founder of Double Rainbouu joined me on stage for the chat providing a variety of perspectives on resort and shared opinions on the future of the season and the perception of our industry in general. In case you missed the conversation in person, read on for some of the key takeaways from the discussion. On the positive impact resort wear has had on the local industry - Resort wear collections have provided a confidence and trust in Australian design, Australian designers have become highly recognised on the global fashion stage because of the spotlight that is shone on our industry at the beginning of the global resort wear buying calendar. On accessing new markets with resort wear - Understand the markets you want to sell into, sure there's an amazing opportunity for Australian brands to flourish in Asia, but you really need to understand that customer inside and out, get on the ground in these countries and do your research, work with local agents. On the opportunities for Australian brands when it comes to resort wear - As the spotlight is shone on Australia for setting the tone for resort wear each year with MBFWA being the first main event of the fashion calendar for the season it's an opportunity for all brands to highlight their unique design aesthetic, celebrate your local makers and continue the conversation about your sustainable business practises. Advice on how to think about resort wear collections within your own business - Remember to stay true to your design aesthetic, don't loose sight of your brand's philosophy, regardless of what season it is and remember it's always beach weather summer where in the world! Just give it a go and learn from your mistakes! Patience is a virtue, no one becomes an overnight success, take your time and get things as right as possible, if you don't have the skills surround yourself with other who do and focus on what you're good at. Emerging designers should not feel overwhelmed by the pressures to over design and produce large collections for resort, just get involved and keep it simple and leverage your data, freshening up your best selling styles in new colours or innovative fabrications.